Therminol VP-1 heat transfer fluid is an ultrahigh-temperature synthetic heat transfer fluid designed to meet the demanding requirements of vapor-phase systems or liquid-phase systems. Superb Heat Transfer Properties—Therminol VP-1 is a synthetic heat transfer fluid which combines exceptional thermal stability and low viscosity for efficient, dependable, uniform performance in a wide optimum use range of 12° to 400°C (54° to 750°F ). Therminol VP-1 has the highest thermal stability of all organic heat transfer fluids. 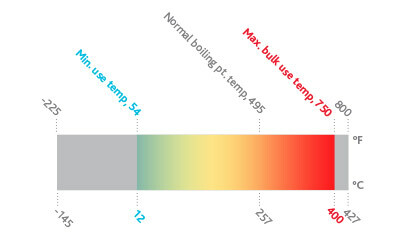 Low Viscosity—Therminol VP-1 has a low viscosity to 12°C (54°F). Because of its crystallization point of 12°C (54°F), this fluid may require tracing in colder climates to avoid operational problems. Vapor Phase Heat Transfer Fluid—Therminol VP-1 is a eutectic mixture of diphenyl oxide (DPO) and biphenyl. It can be used as a liquid heat transfer fluid or as a boiling-condensing heat transfer medium up to its maximum use temperature. It is miscible and interchangeable (for top-up or design purposes) with other similarly constituted diphenyl-oxide (DPO)/biphenyl fluids. Precise Temperature Control—Due to its ability to operate as a vapor-phase heat transfer fluid, Therminol VP-1 is excellent for use in heat transfer fluid systems requiring very precise temperature control.